In chapter fifteen of the Gospel of John, Jesus employs a parable as He continues to prepare His disciples for His departure. The parable is the famous one of the vine and branches. Jesus begins with the outstanding claim of “I AM” and says, “I AM the true vine.” He is, as opposed to all else, THE true vine. Jesus picks up on a thought that was used in Ezekiel chapter fifteen. In that place, the Lord uses the same illustration of a vine and branches to declare that unfaithful people are like unproductive branches and they will ultimately be cut off and cast out. Therefore, on their last night together Jesus is warning His disciples of unfaithfulness. This passage will serve well to warn us too if our hearts are open to the word of God. What the disciples needed to be reminded of was the fact that they would not be who they were if they had not been connected to Jesus all this time. They had come a long way in three years of ministry and it was all because they were joined to Him. This is a great lesson for us as well. You have not come all this way and become who you are today on your own. You are connected to Christ. The disciples were together in that upper room enjoying a meal because each of them had been united with Christ. The same is true of us. We are together in this room today because each of us has been united with Christ. This makes Him the True Vine. He is the one-and-only source that gives life. We all are simply branches. If we could only grasp one thing in our Christian lives, I think this may be it. In the first chapter, John said, “In Him was life, and the life was the light of men.” O, that the Christian would keep at the forefront the truth that Jesus is the Vine. The Scripture also tells us that the Father is the Vinedresser (or Farmer/Gardener). The Father has planted the Vine of His choosing, a perfect and sturdy vine. The branches that shoot out from it are the Gardener’s responsibility. He is to maintain those branches in a way that will allow them to be most productive. In this way, the Gardener takes away unproductive branches and prunes productive ones. It is all about more fruit. How will He yield the most? First, the dead branches must be cut off. They are no good anyway, but with them gone, there is more space for new branches to grow in. As one person notes, “Dead wood is worse than fruitlessness, for dead wood can harbor disease and decay” (Tenney, 151). Second, the productive branches must still be trimmed clean. If the growth of branches is not maintained (cut back, cleaned, etc. ), the branch will not produce much fruit because all of the strength goes to growing and not producing. This idea of pruning allows Jesus to remind His disciples of what He said earlier, “He who is bathed needs only to wash his feet, but is completely clean; and you are clean, but not all of you.” They were clean, not because they were perfect, but because they were connected to Him as vines are to branches. Judas was not a fruit-producing branch. It is the Word that cleans a person. The believer is pruned by being obedient to the Word of God. The picture of a vine and branches continues into verse four. Here is a simple question: Can a branch live and bear fruit without being connected to the vine? The answer is no, especially for the long-term. Jesus is telling us that the same is true of us. We can not live and bear fruit apart from Him. Thus, it is appropriate that He commands His disciples to “Abide in Me.” Disciples are to remain in Him, continually. There is a popular ideology today that expresses that people are mainly good and sometimes they do a little bad. This comes directly from the father of lies. How do I know this? On what authority do I warn you of this? When you study the Bible and heap up the verses on this subject, you realize that God declares mankind mostly bad, apart from Christ, and sometimes people can do a little good. Do not believe that you can wonder away from Christ and remain alive. He is your source of life and righteousness. Abide in Him. Verse five is clear that we are nothing without Christ and can not bear the necessary fruit of righteousness. Jesus says, “For without Me you can do nothing.” Can you picture the vine and the branches? A branch that is not connected to the vine can not live, much less grow and produce fruit. I suppose that you may think to yourself, Well, does this mean that unbelievers can not do anything good? Can they not do any good deed? This goes back to what I previously said. Apart from Christ, people are mostly bad and sometimes a little good. Unbelievers do wonderful things from time to time, but they do no eternally good thing. Christ is telling us that without Him we can do nothing that has eternal significance. Are you connected to the life-giving vine? The imagery continues into verse six. If a branch is unfruitful it is cut off and thrown into the fire. Ezekiel chapter fifteen makes clear that the wood of a vine is not good for building anything that is why it is used as fuel for a fire. This is a picture of judgment. Jesus’ point is that the true believer will be connected to the true vine – and, if not, then the person will be cast out. What does it mean to abide in Christ? Abiding in Christ is His words abiding in you. Picture again the vine and branches. The same nutrients run through the entire plant, in and out of the branches and vine. What is Jesus after here? He wants His disciples to be so full of His words, flowing in and out of believers, that they are constantly in sync with Him, obeying Him, and conforming to Him. Only then can you ask what you desire and it be done. So I ask you, would you hide the words of the Lord in your heart? Would you teach them diligently to your children and grandchildren, talk of them when you sit in your house, when you walk by the way, when you lie down, and when you rise up? These are the words of eternal life. God is glorified when we bear much fruit. Listen closely, this is unmistakable: a disciple of Jesus will bear fruit. It demonstrates that we are His disciples. God is shown to be a masterful Gardener in the beds of our souls when we bear fruit. To this point you may say, Well then, I will get to it. I can show everyone that I’m a Christian. I will clean up my act and walk that straight and narrow path. Do you notice anything unbiblical about that thought? A person can not clean up his or her act and walk the “straight and narrow” alone. The fruit that glorifies God can not be mustered up by you. You can’t look at the commandments of the Bible like they are some formula and if you just follow the directions you will be fruitful and ultimately saved. The New Testament is clear: that will not work. You must abide in Christ. His words must abide in you. Believe on the Lord Jesus Christ, and you will be saved. We have been told to abide in Jesus and for His words to abide in us. We are bridged from that by being exhorted to consider the love between the Father and Son and to abide in it! Verses nine through twelve convey truths that the parable of the vine can not. Mainly, the parable “does not depict the unfathomable love that sets the disciples in this new intimacy” (Carson, 520). Throughout the Upper Room Discourse we have read about the relationship between the Father and the Son. It is at this point that Jesus tells His disciples that they can enter into this same intimacy, this same love. What Christian doesn’t want to abide in His love? It was the Apostle John who wrote, “God is love.” I have meditated on this from time to time and have come to the realization that John could say God is love because there has eternally been mutual love shared between Father, Son, Spirit. Is that not a wonderful description? Before the foundations of the earth, love was conferred between the Triune God (Father, Son, Spirit). Now Jesus tells us that we can abide in that love. That same love is shared with us! I don’t know about you but my soul cries out YES! I want to be a part of that! There is no way to escape the fact that keeping His commandments is crucial to this relationship. You can not operate independently of God and expect to be intimately involved in His love. To abide in His love is to hear and obey, it is to be humbled, and it is to trust His grace. You can not abide in the love of God apart from the Gospel. The Good News declares that we are to believe on the One whom God has sent. Let me give you a quick, earthly illustration: Love between Bridget and me continues on the basis of our submissiveness and faithfulness to one another. This is a trustworthy saying: God will always be faithful to you. The question is, will you remain faithful to Him? If you intend to abide in His love, then you must keep His commandments. Listen to what Jesus said in John 8:29, “The Father has not left Me alone, for I always do those things that please Him.” I pray the same is said of all of us. Jesus foretold certain things so that the disciples might later believe. He also tells us that these things were said so that His joy may remain in the disciples and they are intended to fill up their joy. What has He been talking about? Answer: Abiding in Jesus, His words abiding in us, abiding in His love, and keeping His commandments. Let me assure you of this: there is nothing more joyful than pleasing Christ. 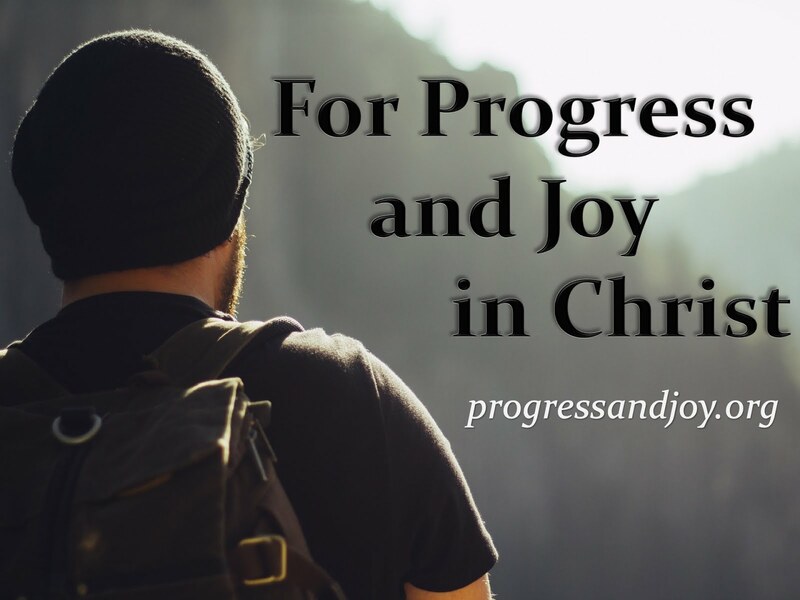 Though the Christian life is not free from concerns, troubles, or sorrows it is a joyful one. The joy of the Lord is our strength. Jesus provides us with a perfect conclusion to this sermon. If we take all these things to heart, if the Spirit opens the eyes of your heart, then the joy of Christ will remain in you and your joy will be full. As opposed to all else, Jesus Christ is the True Vine and you are branches. Abide in Him and fruit will come forth from your life. He has told us the means by which we can remain in Him – stay in His word. I beg you and plead with you to stay in His word. Each and every day would you consider the words of the Lord? They are like honey straight out of the honey comb. They are sweetness to the soul and health to the bones. His word will give you life. May the Spirit of Christ consume this church. May the Spirit of Christ consume each of us, that we would be conformed to His image. To this we have been predestined.